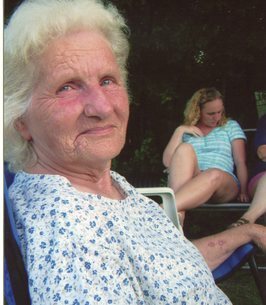 Virginia L. Dyer, of Gordon, Ohio, passed away on Tuesday October 23, 2018. She was born in Adams County, the daughter of the late Frank and Iva Lucille (Ogden) Creech. Besides her parents, she is also preceded by her husband, James E. Dyer on August 1, 2007 and two sisters, Carolyn Lynn Creech and Kathy Sue Black. Virginia is survived by her two sons, Jim and Tom Dyer of Gordon, daughter, Lisa Lewis of New Vienna, five grandchildren, Echo Hiestand, Jessica Dyer, Justin Lewis, William Lewis and Tyler Lewis, two great grandchildren, Lillian and Karr, three brothers, Herschel Creech of Seaman, Frank Creech of Hillsboro and Lonnie Creech of Peebles and four sisters, Clara Yankey of Manchester, Elizabeth Storer of Belfast, Shirley Ann Hawkins of Panama City, FL and Janet Kay Shroyer of Maplewood and several nieces and nephews. Funeral Services will be 2:00 PM Monday October 29, 2018 at the Thompson Funeral Home. Burial will follow at the Greenbrier Cemetery in Seaman. Friends may call from 12:00 PM until time of services on Monday at the Thompson Funeral Home. To send flowers to the family of Virginia L. Dyer, please visit our Heartfelt Sympathies Store. So sorry to hear about your Mother passing. Your family is in our prayers.